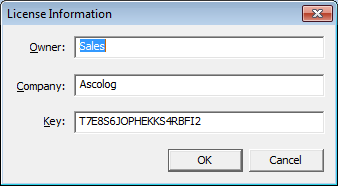 A license issued by Ascolog GmbH is required to use the software. After the software is purchased the customer is provided with the license. However, for evaluation purposes you can also get a free evaluation license which expires after some time. A license consists of the owner name (optional), the company name (optional) and a license key. In order to use the software this license data must be entered in a dialog that pops up when the application is started for the first time, see figure License information. The next time the application is started the license data does not have to be provided again. In order to change a license open the Help menu and select Change License... This will also open the dialog shown in figure License information and you can enter the name, company name and license key of the new license. 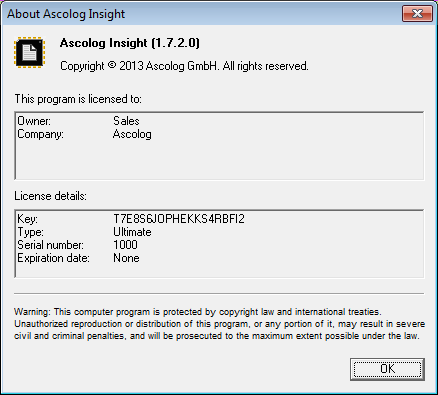 The available functionality of Ascolog Insight depends on the type of the license. A license also has a serial number and it might specify an expiration date. You can check out your license information in the About Ascolog Insight dialog in the Help menu, see figure Version and license information.